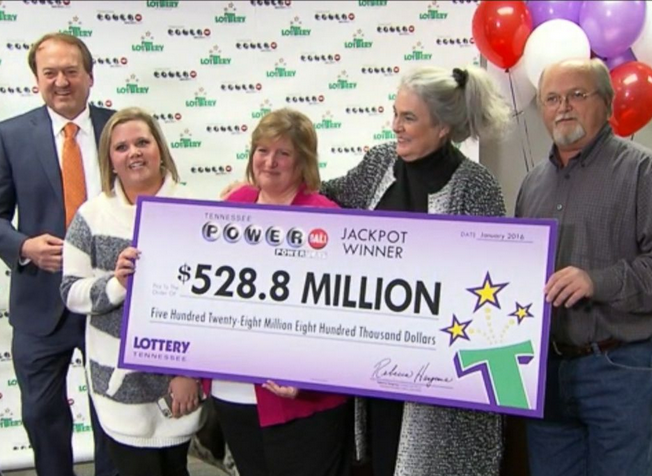 John Robinson and his wife Lisa from Munford, Tennessee come to the Tennessee lottery headquarters in Nashville on Friday with their winning ticket to claim the jackpot. The Tennessee Lottery confirmed Friday afternoon that John and Lisa Robinson purchased a winning ticket to the record $1.6 billion Powerball jackpot. This couple bought four tickets at Naifeh’s Food Mart, a grocery store one block from their home in Munford, Tennessee. They said they plan to pay off the mortgage on their small house in Munford, pay off their daughter Tiffany’s student loans and go back to work. They said on the Today show they would also tithe to their church and give money to help others. Lisa works at a dermatologist’s office. John is a warehouse supervisor. The prize is roughly $533 million if they choose the lump-sum payment, which is $327.8 million after taxes. John Robinson said that he want lump-sum payment, which is $327.8 million. Naifeh’s Food Mart, a grocery store bags the $25,000 bonus for selling the winning ticket. The world record jackpot winning three tickets of January 13th draw, estimated $1.586 million, sold in the states of California, Florida and Tennessee. Two other winning tickets were sold, but those winners have not stepped forward yet.